Discussion in 'Shows & Conventions' started by SWfan, Jun 2, 2011. CVI was announced today!! It will be August 23-26 2012 in Orlando again!! I will definately be there! So who else will be going? Erica and I will be going! 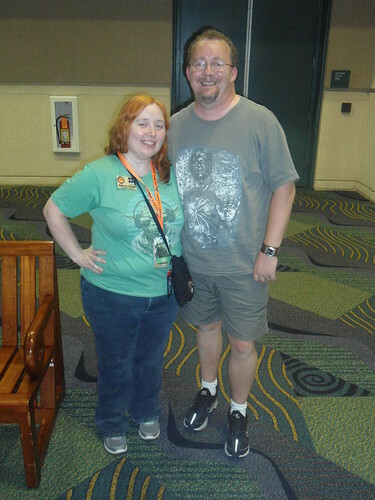 We just booked our rooms at the Rosen Centre, same place we stayed last time. Our friend called and found out they were going online this morning. The Rosen Centre is right across the street from the convention center, and is also were all the celebrities stayed last time....so if you want to sit in the bar and possibly chat with them, this is the place to be. Just made reservations at The Peabody for August 21-27! Yay! I asked Warren if we could stay at The Peabody, but my request was declined. We need to meet up with you this time SWfan! We aren't that scary in-person! Yeah...definitely need to meet up. I'm guessing you booked through the CVI OnPeak website. If you didn't, you might check it if you want Rosen, as OnPeak has the entire hotel as part of it's block. Yes, we'll definitely have to meet up! I'm guessing you booked through the CVI OnPeak website. If you didn't, you might check it if you want Rosen, as OnPeak has the entire hotel as part of it's block. I am also going! Got booked at the Rosen Centre! See all you there! So...who else out there is going? 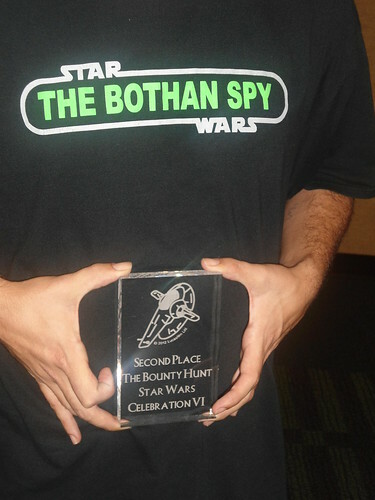 Might we do a Bothan Spy Team-Up with Jedi Freezeman again? Or perhaps catch a chance encounter with the rare Darth Boru? If you plan on attending, please speak up ... we'd love to say hi in person. Starting to finalize our plans for the trip. We'll be departing Texas on Tuesday and arriving sometime on Wednesday, by way of New Orleans. Hope to see some more Spies there! So how awesome was it?? You should know the rule by now: What happens at the expo, stays at the expo. Was a lot of fun. I'll try and post a summary later today. Still in the process of uploading pics to flickr. Here are our 536 photos & 4 videos!! There was even a sighting of the rare Darth Boru! Looks like fun! I want a basket of Ewoks! BTW, Reed sent me a survey since I didn't go to CVI to see what would get me to go to CVII and they had 7 location choices. Las Vegas, Kansas City, Indianapolis, Orlando, Anaheim, Dallas and Cleveland. Yeah...I got a survey too...but haven't filled it out yet. Rumor has it it, that it will be in Orlando one more time as it is contracted for three. Who knows. Orlando is an awesome location...although Dallas would be nice since it is so close. I'd be up for Indy again, or Kansas City. Not especially interested in the others. Anaheim is close to family for me....I grew up going to Disneyland often. Still hoping to post a report this week on our activities.